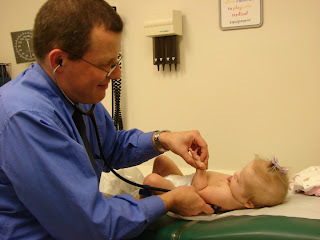 We met Dr. R, the pediatric gastroenterologist, today for consulation regarding the G-tube. My issues with it are really just trying to determine how to decide when it's time to look that direction. He was very informative about what it entails and it's risks and benefits. But the good news is that he said, although she would be a candidate, she is not at the point where she NEEDS to go that route. That's good, as far as I'm concerned. Since she is not having any necrosis concerns in the nose or throat, and since she doesn't seem to eat or nurse any differently when the tube is in or out, we are not at the point where we need to get the NG out for good right away. She has eaten (breastfed) much better the last few days, so that is encouraging. She was going to spend this upcoming week with Grammy Jan so I could get some much-procrastinated work done, but since she's doing better and being more consistent, I'm not going to give up on her yet. Dr. R agreed that we should continue to work with her on this and other oral therapy helps and touch base with him in a couple weeks. He did order some blood work, and we had it drawn after the appointment. On a separate topic, but still GI related, he is concerned about her constipation history along with the DS diagnosis, so he recommended that we do a biopsy of her rectal tissue (ewww and ouch! ), and we've scheduled this for Monday since we're already down here. We've made arrangements to stay the extra day (Thanks tech group for being so darn flexible!!) so we'll be able to get that taken care of Monday morning. He's looking for Hirschsprung's disease, or hopefully ruling it out, but I hope it's not too traumatic. They don't sedate for it, but it's supposed to be very minimally uncomfortable. I have to say that after researching this quite a bit, I really don't think she has HD, but since the procedure to verify that is minimally invasive and quick, we'll go ahead with it. Thanks for all prayers and well wishes. I am praying hard that she continues to feed well and even better all the time. I'm optimistic that she can overcome this feeding stuff without resorting to the G-tube, but I'm aware that it might be necessary at some point. For now, we'll keep working on the progress we've started. And now, it's feeding time again. I hope all goes well Monday! Ask if you can give Braska a little sugar water to minimize the pain just before the procedure. Sometimes that helps. I'm glad things aren't at that point, but also glad you have a backup plan. I'm glad the breastfeeding is going well! It sounds like Braska is doing really well - I hope all goes well on Monday! Great to have you down at the old hacienda, even if only for 24 hours! Thanks for coming and we'll see you real soon! Think back. Move forward. It's time.